We are big Fixer Upper fans just like the rest of America! And people always ask us if Mark is like Chip and if I’m like Joanna. The answer is no. Mark is Chip AND Jo, and I’m basically just his funny sidekick who follows him around and writes this blog! 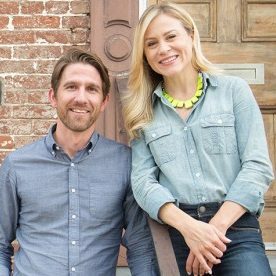 Hate to be that annoying wife who gushes about her husband, but Mark really is the brains behind all our designs and the brawn behind our renovations. He did a quick project at our current home last weekend. Isn’t it amazing what a fresh coat of paint can do?! Mark picked the colors and did all the scraping and then the painting. I offer moral support and watch the baby…because someone’s gotta do that!